As soon as you enter the Albert L. Gricoski Funeral Home you will find an atmosphere of warmth and comfort. located in a residential setting. 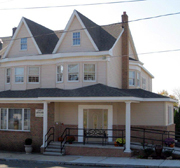 Our funeral home features a spacious visitation room for family and friends. In addition, a sitting lounge and a children’s area is also available for your convenience. Since 1991 the Albert L. Gricoski Funeral Home has been helping families like yours to begin the healing process when faced with the loss of a loved one. The Albert L. Gricoski Pre-Planning Guide is a valuable resource to record your funeral wishes and personal information. Call us to request a copy of our Pre-Planning Guide or you can fill the Pre-Planning Guide out online at your diecretion and then e-mail it to us when it is completed. All these items are available at Albert L. Gricoski Funeral Home, but no two are the same. That's why when you come to us we'll take the time to explain the benefits of each one to you so you can make an educated choice. So take a few moments to examine some of the funeral merchandise we offer and then contact us to learn more.